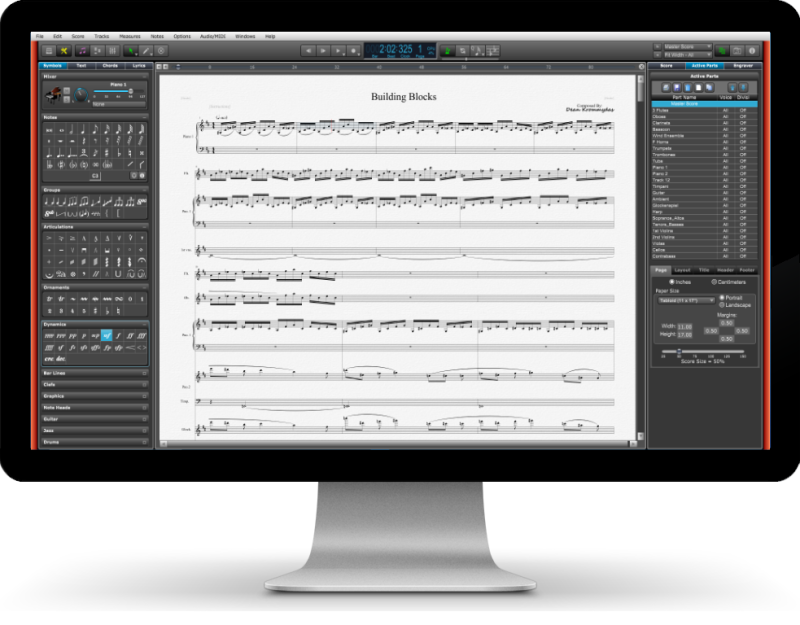 Overture 5, the world's most innovative music notation software has a clean, powerful, easy to use interface. 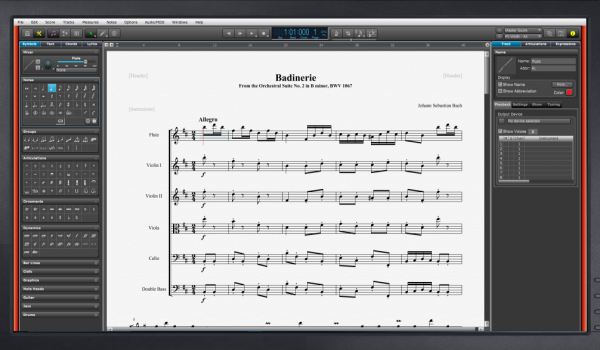 It's robust impressive features give you the best program for creating music scores. Overture 5 is a clear choice at half the price and twice the value. To remain the best, and stay on top, you need to reinvent! 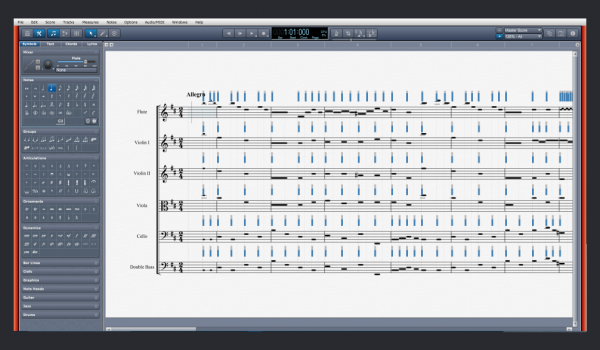 A few years ago Sonic Scores decided to take a new direction in music notation software. 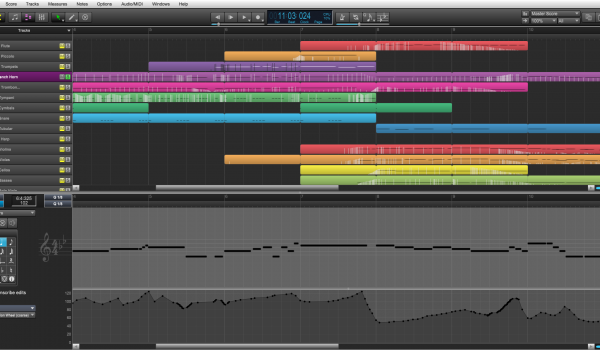 We examined how composers used software tools to create music and redesigned Overture to meet their needs. Here is a quick overview of the new incredible Overture 5. Overture was the first notation program to include MIDI data editing using a Piano Roll and continuous data editor. 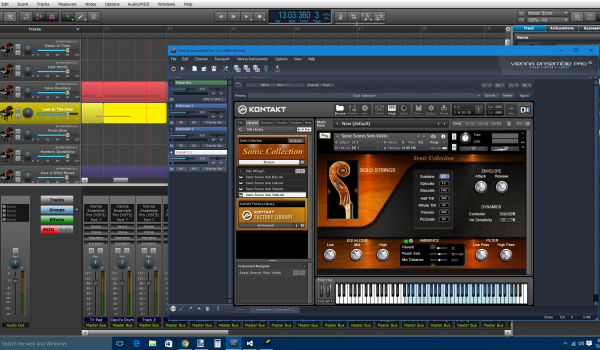 Overture was also the first to notation program to implement VST/AU plugin support. We have always believed that not only should your scores look good, they should also sound great. After all, we create music to be heard, not seen. As today’s technologies have changed, so has Overture. And while our competitors just keep repackaging their same old design, we redesign. Clean, powerful, easy to use interface. Half the price, twice the value. Overture’s single window interface puts powerful editing tools and symbol palettes at your fingertips, so you can spend time composing music instead of searching through menus and dialogs. Overture’s main components are contained in views and panels. You can enter notes quickly on-screen with your mouse or computer keyboard or record a MIDI performance for instant viewing. Most commands can be done with one simple command directly on the score. For smooth workflow, Overture’s panels are organized by basic function type. The panels on the left contain tools for entering Overture’s music symbols and text. The panels on the right are used to change settings for the score layout, track information, and even has a powerful drag and drop file browser for quickly loading or importing scores. 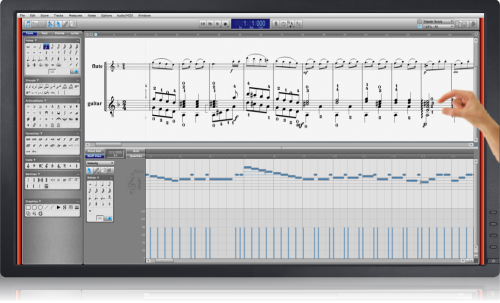 Overture’s Linear View allows you to edit music using a single horizontal display of measures. You can also view and edit each measures’ MIDI data below the view with both views in sync. Overture’s new touch enabled features allow you to work and navigate in ways you never imagined. Get hands-on and enjoy the fun of a touch interface. Swipe to scroll your score or close panels. Tap buttons and controls just like using your mouse. Tap and drag to control sliders and scrolling, swipe to do fast page turning, and pinch to zoom in and out. All common everyday actions can now be perform on your screen with your personal touch. Overture’s 64-bit support allows you take full advantage of your computer’s memory address space over 4GB and you can load new 64-bit virtual instruments that require a large memory space. You are no longer limited to the size of your score or what instruments you can load. VST 3 support allows you to use new VST 3 instruments like Vienna Ensemble Pro 5. In this example Vienna is hosting numerous plugins on a slave machine. 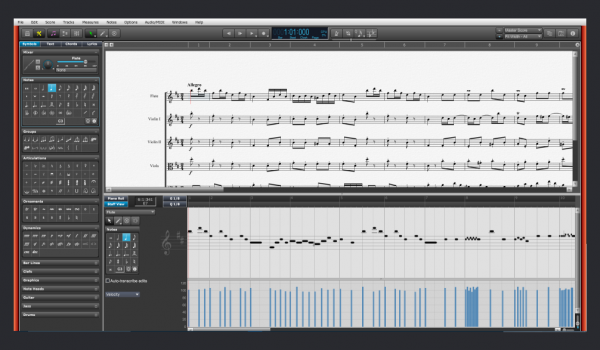 Overture’s incredible MIDI capabilities can be edited directly on your score. Note start times, note durations, and velocities can be changed with your mouse by simply clicking and dragging. MIDI controller data can be added or edited on your score. 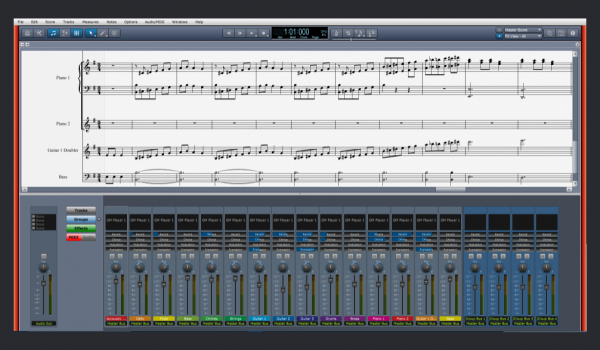 Overture’s Track List and MIDI Data view give you the most powerful editing features among all notation programs. Many features are modeled after popular sequencers. Now that your VST/AU Instruments have been loaded and your score has been entered, its time to do the final tweaking to get that great sound. Open the Track List View to display your MIDI data ready to be edited. Easily draw in or erase existing data right before your eyes. View your MIDI data as raw data on a familiar staff or switch to a traditional Piano Roll, or if you wish to edit your MIDI data along with notation, simply click to switch to Linear View. Overture’s Mixer view gives you the most powerful mixing features among all notation programs. Many features are modeled after popular sequencers. Overture’s mixer has a channel strip for each staff, each with a volume fader, stereo pan, solo and mute buttons, four VST insert slots and four sends. Each send can feed 0-100% of the signal to one of the four master effects. Each staff channel strip can send it’s output to the master strip or one of eight group channel strips. Each group channel strip has a volume fader, a stereo pan, a solo and mute button, and four VST insert slots. The master strip has a volume fader, a stereo pan, and four inserts. The mixer has buttons to show/hide staff channel strips, group channel strips, or effect strips. There is also a button to toggle the staff channel strips to be used as MIDI or Audio. Sonic Scores products are used in classrooms K-12 through college level. Sonic Scores’s academic versions provide both the teacher and the student with the tools needed to foster a successful learning environment. Academic prices are available to qualifying schools, educators, students, and church administrators. Only qualified buyers may purchase academic versions. Please send one of the above to sales@sonicscores.com before purchase and we’ll send you a coupon to get the Academic pricing. Overture 5 is cross platform compatible between Mac and Windows and therefore can read each other’s files but previous versions can not read newer file formats. Note: Overture 5 for Mac can read Overture 3 and 4 files but may have a few problems or limitations with reading older Mac scores.